The most compelling advantage is the greatly reduced fabrication cycle time and consequently significantly lower part costs and higher production rates. TPC opens up a new range of fabrication options. Selecting the optimal method requires consideration of part size, complexity and production process. – Continuous compression molding (CCM). ATC can help you navigate through the range of possibilities to the best solution for your components. A major advantage of thermoplastics is the rapid processing. The polymer is simply heated, formed to shape and cooled with no chemical reaction or cure. Aerospace applications demand the highest performance, a wide service temperature range, environmental resistance and very low flammability. 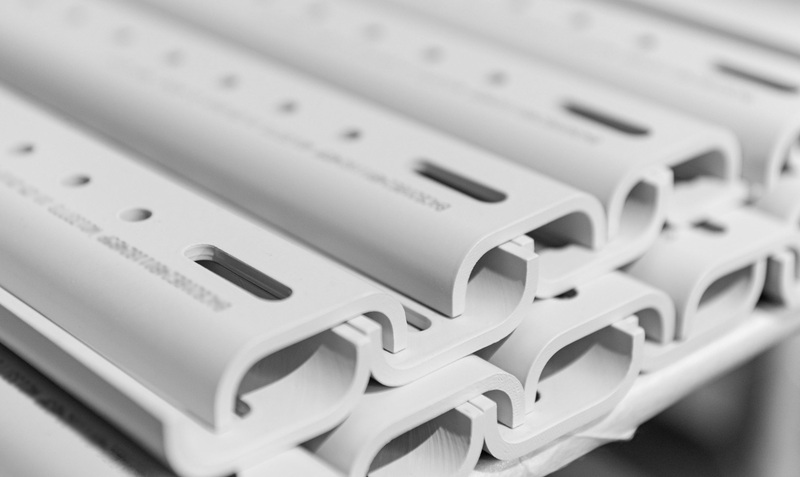 The select polymers have desirable characteristics for aerospace structures and interiors. All the polymers have high service temperatures, represented by the Glass Transition temperature (Tg). The summary table lists the typical Aero polymers key processing and service temperatures and key benefits or limitations. (1) For aircraft structural use. Service temperature must be determined by designer on service requirements. ATC works with prepregs (fully impregnated and powder coated), and consolidated laminates. Additionally, we manufacture laminates in house using a Continuous Compression Molding (CCM) and Press Molding techniques.